I recently came across this interesting graphic entitled Hierarchy of Visual Information. The author clearly states that it is a work in progress, just the genesis of an idea, a not-fully-formed thought. In fact, he rightly points out that this–in general–is not a new concept at all and provides a link to a Google image search result showing many incarnations of the data-information-knowledge-wisdom concept. As I looked at his graphic, a different idea came to mind, a different interpretation of the concept in the context of the Web’s evolution. The hierarchical nature of the illustration made me think of the increasing complexity that comes with increasing connectivity. It made me think of how hyperlinks (more precisely hypertext) preceded hyperdata. I realized that the hyper meme can be extended to the various evolutionary stages of the Web. So, I’m presenting what I call the HyperWeb. The HyperWeb is about increasing connectivity and the increasing complexity of those connections overtime. 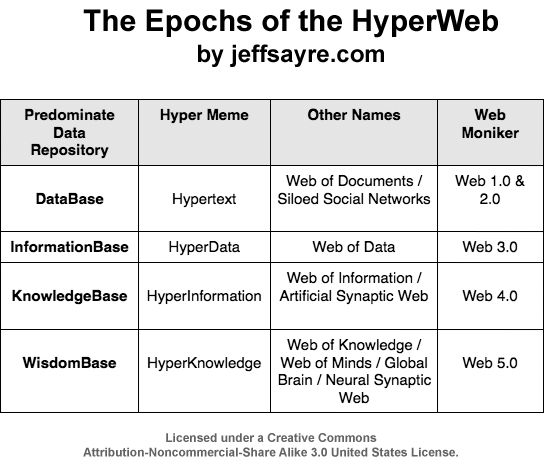 The chart below outlines a few of the salient features that I believe best describe each stage, or epoch, of the HyperWeb. This is my twist to the traditional data-information-knowledge-wisdom concept. Complexity is an emergent property of the increasing connectivity, not a direct result of the Web’s technical foundation and framework. But there’s a twist. There is a positive feedback loop that can cause more connections to be made as the system becomes more complex. Connectivity and complexity thus feed on one another, accelerating the rate of change and pushing the Web faster toward its asymptotic future. 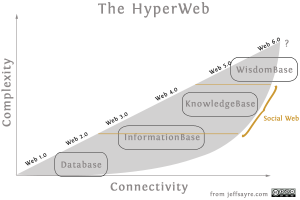 The graph below shows the HyperWeb’s epochs plotted against connectivity and complexity. The straight line shows the approximate points where most people assume the various Web epochs will emerge—a nice linear, one-to-one relationship. In reality though, the HyperWeb’s phase transitions live on an asymptotic curve, they are not linear. The asymptotic curve demonstrates that the initial stages of the Web’s evolution are slow but greatly accelerate with increasing connectivity. I’ve placed the Social Web in the Web 2.5 to Web 4.5 range. If it occurs, that is the zone in which I expect it to materialize, thrive, and then die. What’s that last point? Read on. Whereas the Web seems far away from Web 5.0, you may be wondering what will the World look like if the Web ever evolves to Web 5.0? You might also wonder what the heck is Web 6.0? For one possible set of answers to those questions, see my thought piece, Cybernetics, the Social Web, and the Coming Singularity. It’s important to point out that, just like natural speciation, the continued evolution of the HyperWeb is not guaranteed. As with all evolutionary processes, advancements (innovations) may stop at a certain point. The Web is a democratizing force that can help redistribute wealth and power. That is antithetical to most large companies interests—and a number of countries as well. Apple, Twitter, Facebook–and of course the phone and cable companies–want as much control as possible. They are fighting for control of the Web, not for the health of the Web. It’s possible that for political, societal, or economic reasons–or some combination thereof–that the HyperWeb’s evolution may be curtailed. For instance, due to myopic business leaders, scared political leaders, or an uneducated, apathetic citizenry, humanity’s journey on the HyperWeb may not progress past Web 2.0 or Web 3.0. Each new Web epoch will bring opportunities and uncertainties. The changes will be transformational, reshaping global society. If the Web continues to evolve to higher and higher levels, individuals will increasingly be the main benefactors, not business or politics. As such, the vision and drive to bring each new paradigm shift to fruition will come more and more from the Web’s users and not the Web’s businesses—although revolutionary advances in technology will be required all along the way. If society wants a truly Social Web, then people need to fight for the Web, to help push it past its 2.0 version, past its current limitations and restrictive user control. The HyperWeb will continue to evolve only if the Web’s netizens make it so. could u help me?I create a OWL File about a matter and now I want to publish it on the web and see it with browsers! I don’t know how to map it to a file(like .ttl or dump) for seeing in web. OWL ontologies are exchanged as RDF documents. Please take a look at this W3C resource. 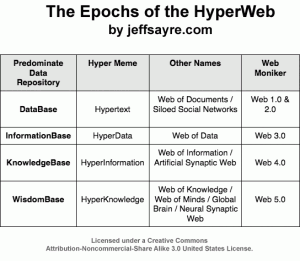 Yet another thoughtful post on the evolution of the Web, and I agree that the various epochs you outline represent continued shifts in the power dynamic represented by our increased connections. However, those connections are made possible by the Internet, not by the Web. We have to constantly remind ourselves that the Web is a presentation layer to the Internet, a theme that you know I hammer on constantly in my CLOUD-enabled view of the Internet. In order to engage the connections you outline with your vision of a HyperWeb, we will need to add another dimension to the connectivity and complexity curve you have outlined. This new dimension will be based around ME 1.0 and will provide the necessary inflection points to the vision you have for the future of the semantic web. As you know, CLOUD does not see the semantic web as simply a linked data issue but also a linked people issue. We have a lot of different views into our connections with each other. One set of presentation tools for seeing those connections is the Web which allows us to have tools like Facebook to see our social web. I would argue that email and twitter are also windows or presentation layers into our connections, with more limited focus in their functionality (http://bit.ly/fFS1LW). Regardless of the window into the connections, the Internet remains at the core and thus is the place in which the new language for people (and connections) must be embedded. This revolution of ME that CLOUD is building, I believe, will be a fundamental component of the Social Web vision you paint. Looking forward to your Cybernetics post in the coming weeks!! Thanks for your insightful comments. The Web is more than just a presentational layer. It is one of several of the Internet’s platforms—mobile is another one. The Web has a strict set of platform protocols, only some of which have to do with presentation. But, as you state, the Web is just one facet of the Internet, that online social connectivity can and does occur beyond the Web. In fact, some of Twitter’s and Apple’s activity (and eventually Facebook) have moved partly off-Web–or chosen to bypass the Web all together–so as to better control their environment and their users. Desktop applications like TweetDeck and Apple’s Ping social network, and Mobile-based apps (those that do not access the Web), all exist off-Web. Desktop applications access the Internet directly, the smartphone apps utilize the Mobile-based Internet. If a resource does not have a dereferenceable URI, then it is not a Web resource. I believe that humanity’s travels across the Social Web will be facilitated primarily via the Web. There are a number of reasons for this. The most fundamental is that the Web is a democratizing platform. It’s existence and function are currently beyond the control of any one entity. Second, the Web makes it easy for anyone to participate, to quickly create their own user-controllable communication channel. No other Internet platform offers that freedom and power. It’s important to note that as the HyperWeb evolves past the Web 4.0 epoch, there will be a shift in understanding, function, and definition of the term “Web”. That is a topic for my upcoming article! Awesome post. Also looking forward to your follow-up posts towards the Singularity. I think the epochs you described are inevitable, but as you said, the desire for control comes as a great threat to its growth. However, I consider this to be a natural thing. Basically, due to the old mind-set of control and the increasing popularity of regulation, we have a relatively fragile web. The growth of this web will stagnate for a while, until… Another S-curve intersects it: Decentralization. Thanks for your thoughts. I like the idea of a decentralization S-curve intersecting the graph above. I would speculate that that would occur somewhere between the Web 3 and 4 epochs, perhaps even marking the inflection point where the Social Web truly begins. I’ll have to think about that and possibly redraw the graph. I agree that the Web’s evolution is likely inevitable and that there will be a period of stagnation as politicians struggle with how to control “their piece” of the Web and those that are fearful of change fight to place restrictions on its growth. I believe that one powerful, countervailing force will break through the stagnation, allowing the Web to continue its journey–that force will be new transformative technologies. By the way, with regard to your question about PayPal, are you aware of PaySwarm? It is an initiative of Manu Sporny who, among other things, is working on redefining micropayments on the Web. It strikes me that one of Seb Paquet’s ideas is germane to the idea of Web 5.0 – the web of wisdom, and it is his notion that intent needs to be a first-order data object in a technological environment better optimized to support emergent social phenomena http://www.quora.com/Seb-Paquet/What-would-your-ideal-environment-for-supporting-emergent-social-phenomena-look-like . A network that has been the repository for human intentcasting for awhile http://emergentcities.sebpaquet.net/?tag=intentcasting, if it also began learning and storing selection criteria for intent – so it could select against weak or poor intent and select for more promising intent… it seems to me that wisdom could accumulate in such an expanded networked cognitive system…. I agree. As the currently dominate species on Earth, properly assessing human intent is crucial to our survival as we creep ever closer to a possible singularity. The real question, of course, is, What constitutes good versus bad intent? The politics and subjectivity inherent in answering that question are massive issues.